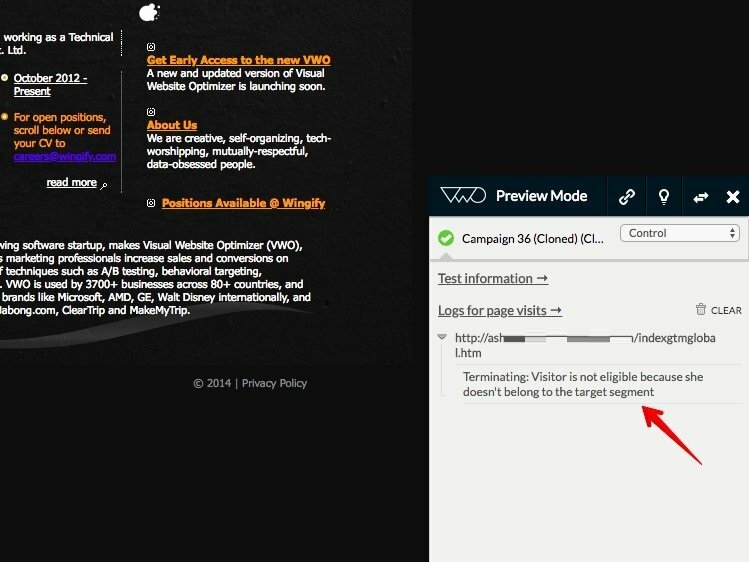 By using VWO Live preview, you can verify the changes applied to your website before making it active for your visitors. 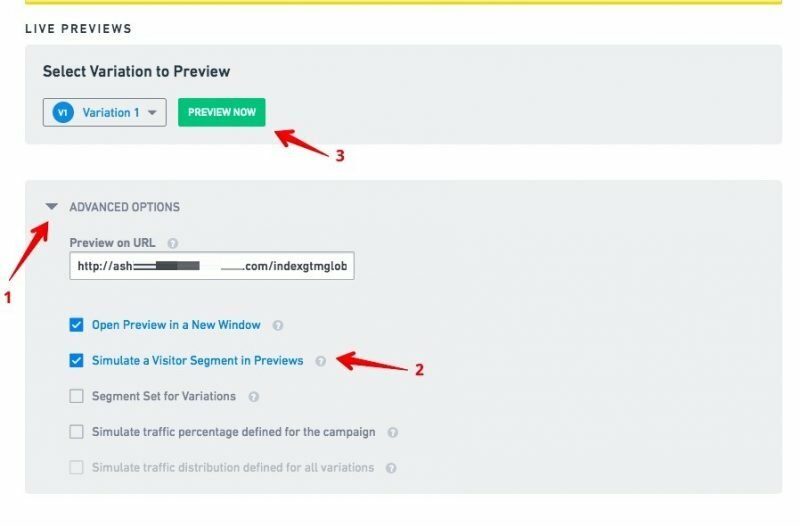 In addition to reviewing the changes, you can also use Live Preview to check your visitor target or verify that the goals are working as expected. To understand how to verify segmentation by using Live Previews, let us assume you create a segment with the cookie value “signedup” to identify your registered visitors. If a visitor is registered, the cookie value equals to 1, else the cookie value equals 0. Select the test you want to verify, and then go to the Previews tab. Select the variation you want to preview. Go to Advanced Options, and then select the Open Preview in a New Window and Simulate a Visitor Segment in Preview check boxes. The preview of the selected variation (Variation 1) opens in a new tab with the preview debugger message. If the defined cookie is not found in the visitor’s browser, the Preview Mode pop-up window confirms visitor exclusion. On the other hand, if VWO finds the cookie value defined in the visitor’s browser, Preview Debugger confirms the cookie and makes the visitor a part of the test. The segmentation preview option is available only through the Preview debugger. Segmentation conditions are not applied to previews loaded through live preview links. It is recommended that you clear the cookies if you have used live preview for the test earlier to make sure that existing preview cookies do not conflict. Enable the Simulate a visitor segment in previews option every time you want to verify segmentation. The option is not selected by default.